Xiaomi is working on an affordable smartphone (unnamed as of now) priced at as low as CNY 399 (approximately $65 or Rs. 4,000), if a report emerging from China is to be believed. The unnamed budget Xiaomi smartphone is said to feature LTE support, apart from an HD (720p) display and pack 1GB of RAM. According to Gizchina (via Mydrivers), the Chinese firm that is often called China’s Apple recently invested in a chipmaker named Leadcore, and the rumoured Xiaomi smartphone is likely to be based on the new Leadcore chipset. 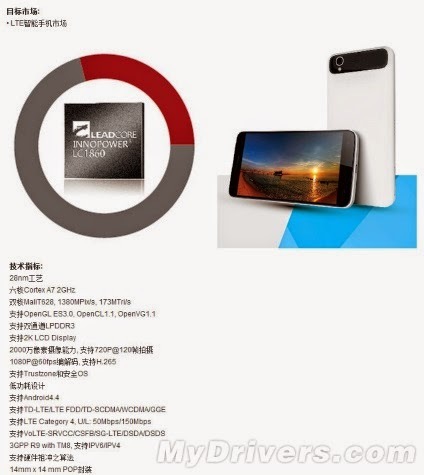 The rumoured Leadcore chipset is the LC1860, which is said to be built on 28nm fabrication processor and utilise 2GHz Cortex-A7 cores (no word on the number of them) alongside a Mali T628 GPU. Further, the chipset as per a leaked specifications sheet will come support up to 2K LCD displays; record videos up to 720p at 120fps and 1080p at 60fps, apart from 4G LTE, 3G, GSM/ EDGE, WCDMA, LTE FDD, and TD-LTE network connectivity.